These Frenchmen are a gang of sub-humans! and they have forced us to flee. The man who would later be known as “the little corporal” was one of the greatest conquerors known to French history. His journey brings to mind that of the Emperor Alexander the Great. Napoléon Bonaparte was born at Ajaccio, Corsica, on August 15, 1769. The Bonaparte family was originally from Florence and Corsica. 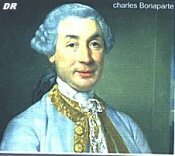 His father, Charles Bonaparte, the product of a good family that originated in Italy, was close to the Corsican patriot Pascal Paoli, who had struggled against both the Genoese and the French and who later exiled himself in Britain. Charles Bonaparte remained in Corsica and became a supporter of France. An intelligent and amiable man who was both educated and spiritual, he was nonetheless ostentatious and prodigal. His wife, the beautiful Laetitia Ramolino, possessed an intrepid and resolute character. Her sense of economy bordering on greed permitted her to properly raise the eight children born of this union. She spoke in a Corsican dialect and never expressed herself in correct French. She named her second child Napoléon, a name that was quite rare in Corsica. His mother, whom he called “the Corsican,” brought Napoléon up strictly. She would not tolerate any misbehavior, yet Napoléon loved her tenderly. Around his cradle, and again later around his first steps, he was surrounded by female figures, including his grandmother, Maria Saveris Bonaparte, who was very indulgent and devoted and who loved him well. From a very early age, Napoléon exhibited a character that was difficult, willful, and sometimes inflexible. He was attracted to a military career and wished to possess what he saw soldiers wearing in Ajaccio : a plumed hat, epaulets, sword, musket, and bayonet. He began in a school conducted by nuns. He showed himself to be studious and eager to work, especially at calculations. He was nicknamed “the mathematician.” He continued his studies at a Jesuit school where, at the age of eight, he had such a passion for mathematics that the family built him a tiny shed behind the house, where he could isolate himself to work. In a course taught by the Abbot Recco, all students were divided into two groups, the Romans and the Carthaginians, and encouraged to compete against each other to stimulate their efforts. Napoléon, angered at being placed among the Carthaginians, insisted that he be transferred to the Romans, the conquerors. In 1778, Charles Bonaparte enrolled him in the College of Autun, operated by ordinary priests rather than a monastic order. Joseph was destined for the clergy and Napoleon for a military career. The young man was pensive and very irritable, especially on the subject of his tiny country. against the king of France. Even at that time, the student Bonaparte was aware of his military aptitude. He declared: “The military is the finest of all bodies. I sense that my will must triumph over that of others and that what I wish must come to me.” He wanted to be great, to have a place in history and to attract contemporary attention to himself. He admired Sparta : “The emotions of a Spartan,” he said, “are those of a strong man.” Thus his comrades referred to him as “the Spartiate,” which explains much about his attitude. His studies were also brilliant, and in July 1783 he was authorized to report to the royal military school in Paris to complete his education for the army. He was sixteen years old, and sought a future in the navy or the artillery, learned arms where favoritism and riches would never take the place of merit. One day in September 1785, the great mathematician Pierre-Simon Laplace came to the school to supervise the examinations that would determine whether students were qualified for promotion or graduation. 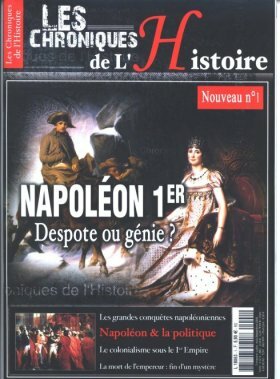 Napoléon came forward. He was still somewhat distraught by the death of his father on February 24, 1785, but the professor, a great man, was merciful. Out of the corner of his eye, Napoléon saw the imposing face of the savant. He traced the figures, his equations were resolved without difficulty, geometry was somewhat lacking. But, these were only minor mistakes. On September 28, the results were posted. Napoléon celebrated: he was a second lieutenant assigned to Auxonne. “This is for my father,” he thought. He arrived at Auxonne on November 14, 1785, dressed in his new uniform as a second lieutenant. The headquarters of la Fere was rather large, and he carefully explored its buildings. He took up his quarters and began to follow the instruction to become captain of artillery. Napoléon finished reading each treatise in at most one night. He studied particularly the new writings of Jean-Baptiste de Gribeauval, theoretician of modern warfare.